This Christmas day, I unwrapped a present from my landlady and, completely unexpectedly, a small purple hardback book with gold lettering and a beautiful portrait of Virginia Woolf fell onto my lap. I was delighted, and proceeded to read it cover to cover amidst wrapping paper and ended up holding back tears to prevent myself being utterly embarrassed in front of my in-laws. She sliced like a knife through everything; at the same time was on the outside, looking on. 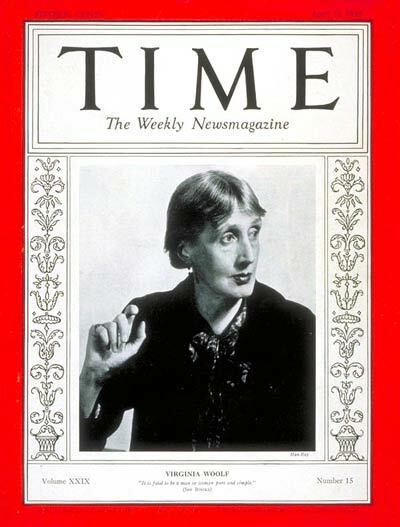 This liminality, both the relation between work and life and Woolf’s psychological flux, is represented thoughtfully throughout the biography. Alkayat focuses on the personal details of life: how Vanessa Bell’s sheepdog Gurth accompanied her “street haunting”, how Leonard and Virginia Woolf spent nights during the First World War in their coal cellar sitting on boxes, and that they later named their car “the umbrella”. She also puts us on a first name basis with Virginia, Vanessa and Duncan, et al. – a choice which made me feel closer to their world. Cosford’s illustrations are both sensitive to the Bloomsbury style and offer a fresh perspective. Her bold lines and patterns used to illustrate the pages about Vanessa Bell’s cover designs for Virginia Woolf’s novels, for example, are edged with mark-making in the mode of Bell. Her use of colour also seems emotive, following the waves of high and low that punctuate the narrative. Her illustrations capture the paraphernalia of every-day life, from the objects atop Woolf’s writing desk – diary, hair grips, photo of Julia, sweets – to the plants in the garden at Monks House, bringing Virginia’s life closer to home. Illustration and text come together beautifully in this miniature autobiography and would provide any reader with a poetic and surprising escape into the life of Virginia Woolf.